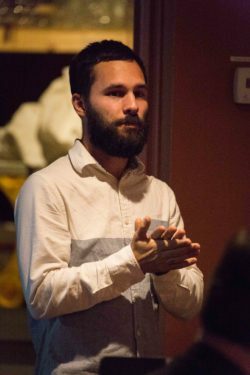 Dan Daly is a Brooklyn-based scenic designer and visual artist. Last season he brought the aesthetic movement to Boston with his critically acclaimed design for Odyssey’s production of Patience; or Bunthorne’s Bride. He returned this past fall with a depiction of Calais under siege in the second installment of our Trial By Fire season in L’assedio di Calais. Now, as we head into rehearsals for our final production, Verdi’s Giovanna d’Arco, we wanted to learn more about the design process and what goes into bringing this opera from page to stage. This is your second design in our Trial By Fire season, and we are so happy to have you back! How is your approach to designing Giovanna d’Arco different than when you designed Siege? The main question that scenery answers is “where are we?” This does not just include physical location and time period, but also where the story is from an emotional context. While Calais and Giovanna both take place in the same country during roughly the same time period, the stories live in incredibly different emotional places. While Calais is about a trapped community living in despair, Giovanna is about personal, as well as societal, revelation. Because of these differences I rooted the world of Calais in a sort of stoic stasis where large lumbering walls stayed onstage the entire opera and were simply reconfiguring to create different locations. With Giovanna, on the other hand, I tried to draw connections between the regal, religious, humble, and violent worlds that Giovanna experiences through the opera. Keeping the audience from knowing what the next stage picture will be while having it still fit in within the overall framework of the design helps bring the “revelatory” quality of the piece through. You use imagery in your preliminary research for inspiration, how do you find these images? What is that process like? If you are going to be a scenic designer you have to know your art and architecture history. I always try to connect emotional qualities of the piece I am designing to materials and artistic movements that pair with the story we are telling. I have picked up quite a few tricks on how to use Google image search to find exactly what I am looking for and Wikipedia is actually a great place to find large amounts of images that are free to use. Even with all the modern conveniences of the internet and digital archives, I still find myself drawn to my large stack of art and architecture books when I start my research as there is no better way to be inspired than to flip a page and be hit with a beautiful image that works. What image is the biggest inspiration for your design of this production? 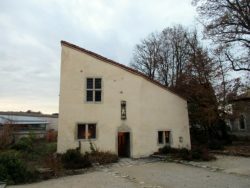 While the set has ended up looking almost nothing like it, this image of Joan of Arc’s house heavily influenced the design. The house’s extreme asymmetry, starkness, hints of time period, and the extreme angel of the roof all lead to different features of the set. The fact that a woman so historically significant began in a place so humble pushed me to find ways to, much like this house and Joan’s life, create impactful moments which are rendered simply. What was the most difficult/challenging part of designing this show? Giovanna d’Arco does not follow the historical narrative of what actually happened to Joan of Arc. Because of this there is a lot of tension where at times being truthful to history is not being truthful to the piece. I found it challenging to find the correct line to walk in my design between historical realism and utter abstraction. We can’t be purely real because this opera is not, but at the same time we can’t be completely abstract because it follows a historical figure. We ended up with a set that falls in an interesting space where we found ways to visually abstract historical truths which helps draw parallels between the worlds of Giovanna and Joan. My favorite parts of the design process are its bookends; the prelim research work, and the tech process. I love discovering imagery, shapes, concepts, and materials that tell the story we are trying to tell. At the beginning you can flex your design muscles and go down any paths that seems promising. While the beginning is all about conception and building ideas, seeing all of those ideas finally coming to fruition and polishing them is what the tech process is all about. No matter how much fun all the other parts of stage design are, it is all about the finished product and the last few decisions made to push the design during the tech process. Adding an extra painted shadow or changing out one design detail for another can absolutely make the entire design and you will never know until you are in the space with the set.